The MATLAB prompt is that place where you type formulas, commands, or functions or perform tasks using MATLAB. It appears in the Command window. Normally, the prompt appears as two greater-than signs (>>). However, when working with some versions of MATLAB, you might see EDU>> (for the student version) or Trial>> (for the trial version) instead. No matter what you see as a prompt, you use it to know where to type information. You can utilize a useful command known as clc. 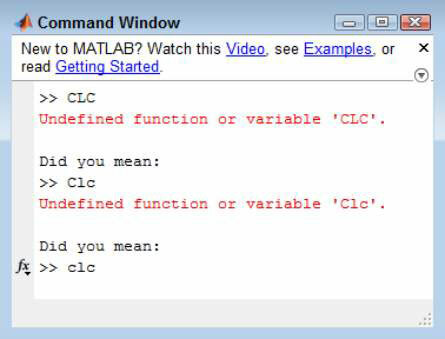 Try it now: Type clc and press Enter at the MATLAB prompt. If the Command window contains any information, MATLAB clears it for you. The userpath() function is called a function because it uses parentheses to hold the data — also called arguments — you send to MATLAB. The clc command is a command because you don’t use parentheses with it. Whether something is a function or a command depends on how you use it. The usage is called the function or command syntax (the grammar used to tell MATLAB what tasks to perform). It’s possible to use userpath() in either Function or Command form. When you see parentheses, you should expect to provide input with the function call (the act of typing the function and associated arguments, and then pressing Enter). Next, type Clc and press Enter at the MATLAB prompt. This time, you see the same error because you made the “same” mistake — at least in the eyes of MATLAB. If you see this error message, don’t become confused simply because MATLAB didn’t provide a clear response to what you typed — just retype the command, being sure to type the command exactly as written. Notice also the “Did you mean:” text that appears after the error message. Normally, MATLAB tries to help you fix any errors. In some cases, MATLAB can’t figure out what’s wrong, so it won’t provide any alternatives for you. Because MATLAB was able to provide the correct command in this case, simply press Enter to clear the Command window. Look in the Command History window. Notice that there is a red line next to each of the errant commands you typed. These red lines tell you when you shouldn’t use a command or function again because it produced an error the first time. You should also avoid adding errant commands and functions to any scripts you create.